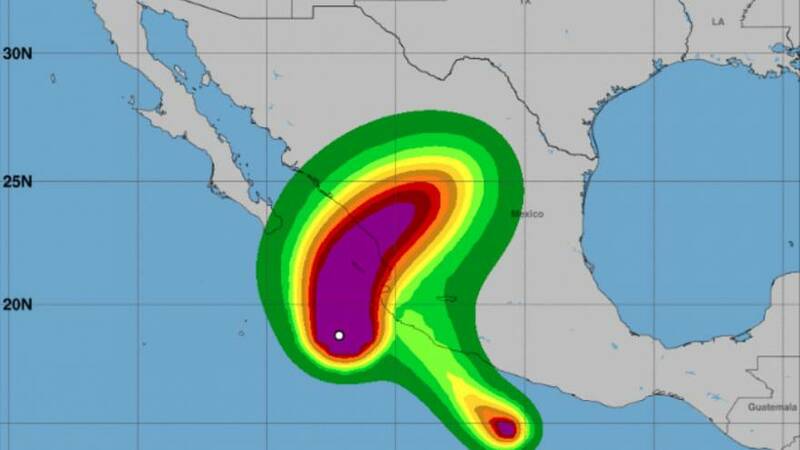 A "potentially catastrophic" hurricane is expected to make landfall in Mexico on Tuesday. Hurricane Willa reached a maximum sustained speed of 160 mph (260 km/h) on Monday morning, according to the US National Hurricane Center, strengthening to a rare category 5 storm. Category 5 is the highest grade on the Saffir-Simpson scale. The hurricane is expected to landfall along the southwestern coast of mainland Mexico on Tuesday afternoon or evening after speeding through the Islas Marias — an archipelago of four islands located in the Pacific Ocean some 100 kilometers from the Mexican mainland. "Willa is expected to be an extremely dangerous major hurricane when it reaches the coast of Mexico," the NHC said in a statement. Officials forecast that after strengthening over the past 48 hours, Willa should weaken somewhat on Tuesday, but they expect it to bring a dangerous storm surge with "large and destructive waves". They also warned of heavy rainfall, including up to 18 inches in some areas across western Jalisco, western Nayarit, and southern Sinaloa which "will cause life-threatening flash flooding and landslides." The south of Mexico is also expected to be hit by Tropical Storm Vicente, scheduled to make landfall on Tuesday. It should bring heavy rainfall of up to 10 inches in areas in the state of Guerrero, Michoacan, Colima and Jalisco.